rero Annual Championship, or better known as RAC, is a national level robotics and coding competition which aims to promote Science, Technology, Engineering and Maths (STEM) education among primary and secondary school students. This competition is endorsed by the Ministry of Education and is in support of MDEC’s #mydigitalmaker movement. Last year, at our very first rero Annual Championship, 107 teams from over 50 schools nationwide battled it out in four robot games over the 3-day event. This year, we have over 190 teams registered, including teams from Indonesia. In RAC’17, participants will compete in 5 different categories using rero robotics system. rero, short for REconfigurable RObot, is an educational robotics kit that is fully designed and manufactured by Cytron Technologies, a local tech company based in Penang. In Live Coding Challenge, participants are given coding challenges for them to solve on the spot. Robot Siege is a tactical game, in which teams attempt to attack and weaken their opponents’ cities while trying their best to protect their own territories from the enemies’ onslaught. In Robot Survival, four robots battle it out to seize the Victory Cup. In rero Math It Out, participants are tasked to form mathematical equations using numbers collected by their robots. This game not only challenges the participants’ programming skills but also put their mathematical sharpness to the test. 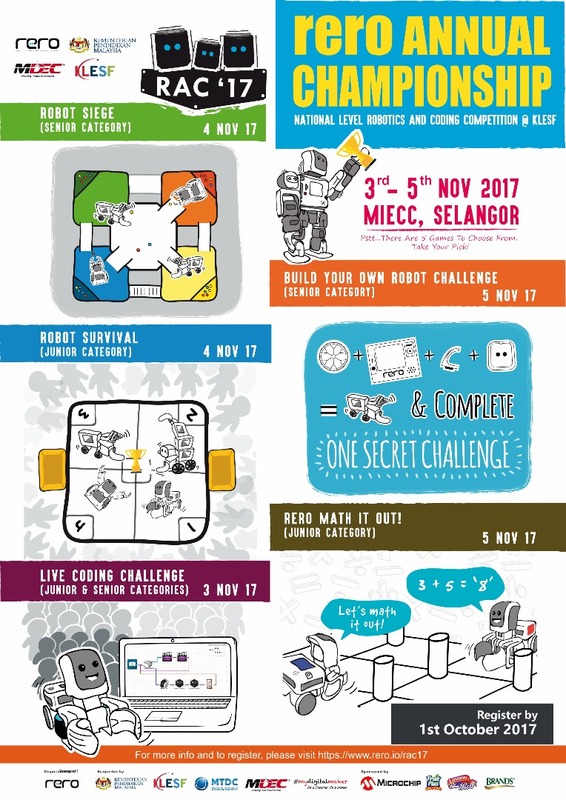 Last but not least, in Build Your Own Robot Challenge, teams are challenged to build and program their own robot on the spot to complete a given task. Besides testing their robotics and programming skills, each game is specially designed to promote team work, computational thinking, creative problem solving and innovation. This event is organised by rero Edu Sdn Bhd and sponsored by Cytron Technologies, Microchip, London Biscuits Bhd and Brand’s. For more details about the event, please visit www.rero.io/rac2017 . Join us at RAC’17 as we celebrate this annual gathering of rero robot makers!